﻿ "Being" at peace, having metta and using vehicles "yana"
"Being" at peace, having metta and using vehicles "yana"
Johann: Modern (ab)art of conversation and old patient culture... great training only serious take on and rushing hide on messanger, fb, or in the ocean of Maras internet. Mudita. Johann: Nyom Villa. Atma does not understand all circumstances but much mudita and appreciantion with sharing merits with each other, taking each other along good. Johann: Another fullmoon, another chance. It's not sure that breaking apart will make it the last. May all spend a auspicious Uposatha. Johann: May all bring some merits left into this new year for them! Johann: A meritful Sila-day and much rightly joy by doing merits. Johann: May all spend a meritful old month over New month birth day this day. Khemakumara: Tomorrow is new moon uposatha, take this noble opportunity to come together in khema (peaceful). It is not common, that living beings are in contact with Buddha, Dhamma, Sangha. Moritz: Good morning Bhante and Chanroth And good night to me. Johann: One not having overcome sakayaditthi is not capable to judge right and will always be corrupt. Johann: One would not let go of ones stand/home. Johann: As long as Saddha does not arise, it's not right view but stuck in "panna". Johann: Like a path would disappear fastly in the forest, the path for many unseen if nobody steps on it. Johann: Because Uppekha isn't the highest and nobody would benefit from it. Johann: And why the even Noble ones and Arahats continue asking, answering, coss-question, giving Anumodana, critic? Johann: Once knowing good and bad, no more independency of approve of others, thanks, praise for ones sacrifices. Johann: What ever one does, one does for him/herself. Knowing this it's importand to give praise and approve to ones own skillful deeds, shame and disprove to bad. Moritz: I am leaving my computer to work without me. May all have a good Uposatha day. Moritz: Ja, gut angekommen. Noch nicht ganz umgestellt. Bald wieder los zum Taxifahren. Johann: Meister Moritz. Gut angekommen und wieder umgestellt? Johann: May all spend a meritful Sila-day and be able to recoice with their beauty of having given all being the gift of the Uposatha-Silas. Cheav Villa: មិនខុសពីរឿងទៅសុំសៀវភៅសន្ទនានុក្រម នៅវ ត្ត បញ្ញា​ និង..
Johann: Others, even if pure, is open for critic and bad assumings. Envy, jealously... on each side. So to become not susbected, needs good advices, double hard for woman to act perfect. Johann: Pappies can give good lessons when they don't fall, but the deeper, the hard training, must come from liberal mommies for daughters and liberal pappies for sons, in the world and for beyond. Johann: Does mommy generally don't actually love her child when not react? Johann: Mommy, mommy... but I like... ohh, they bite me... I am hungry... when do we go back?... why must we sit here... mommy! Johann: Which can be changed all the time, with feeding rightly. Johann: Nyom Vithou. Foot well again? Johann: Good stories: The Healing of the Bull and Prisoners of Karma . Johann: Although monks are allowed to explain how to work oneself out, they are not given to liberate "slaves", prisoner, as this would count as thief. Who ever likes to challeng my person, better the for sure the Noble ones and their costums, may give it a try. More might be explained by "Deva" Gus, or Upasaka in this regard. Re: "Being" at peace, having metta and using vehicles "yana"
What is the difference between the goodwill of metta and the goodwill of panna? One practices self-benefit and others'-benefit by applying the panna. This is a goodwill. Metta is also described as good will. So is metta equal to panna? or Is self benefit not included in metta? Tough speaking is also a part of goodwill. (pharusena pi aham ...). So, if one has such a thought (like a father force-feeds medicine to a baby), will he be able to be protected from an terrible animal? Isn't that tough thought felt by the animal and get angry? What about finding Metta, if searching, as root of Sila, right effort? Does it require "pañña" to have right effort (samma saṅkappo)? "And what is right resolve? Being resolved on renunciation (alobha), on freedom from ill-will (adosa), on harmlessness (amoha): This is called right resolve." Or other way asked: Is metta without Sila not just hypocratic? Who does Deva gus prefer? The mouse, or the snake? Does Deva know mices and snakes, their children? So whom to help? Are their children who possible kill their father? Why does one kill? Does a thieve steals because he likes to harm? Does a father or mother kill, because he likes to harm? Does any being harm others because it simply likes to harm? Does a morder seek for happiness? Does a monk, advicing you wrong, seeks not for happiness, security. Does the mosquito likes to hurt you? Do you like to hurt? Isn't it not out of fear, out of hope for happiness? My person tried hard to find any being that not simply hurt him/her/it and others by not actually try to find peace. So it's possible just the way, just actually not knowing how? If Deva gus would seek security in signs, would it last? If Deva would seek security in sound, would it last? Does Deva know any sound that lasts, or any sound he would dislike if hearing all the time, getting angry or learn to ignore it? What about smell? Not what one has heard or read. Look for youself, Deva. What about taste? Every day just this curry, or every day another dish? What about it? How much burden and deeds to gain it. What about right after or between? Is it possible to have metta if not letting go of it. What does the father love, when he looks after his son, kills a chicken to feed, or fights at the front for his family? Does he protects his son, what is his son? What about thought? Did not every tought hurt at least? Maybe try this? Would metta, right resolve, require seeing, facing, knowing? What would Sila be, if not based on metta? What would metta be without being based on right resolve for alobha, adosa, amoha? The metta of a mouse or a snake? Isn't this body already broken? Just some hours again, asked Bhante next as well. Did Angulimala, could he catch the Samana " Stop, Stop!" Did the Buddha used any Yana? He said something like "We already stopped." So where does Deva like to fly to find peace, or where do monks like to drive, fly or use others to bring peace. My person asked, somewhere else, what cetovimutti, paññavimutti means. Maybe a Pali-grammer-scholar, can explain the freedom from pañña? My person never met, learned this, not even seeked for it. But alway wondered about the translation grammer or interpretations. 16. "Cunda, it is impossible that one who is himself sunk in the mire should pull out another who is sunk in the mire. But it is possible, Cunda, that one not sunk in the mire himself should pull out another who is sunk in the mire. (1) A person given to harmfulness has harmlessness by which to attain to the full quenching [of it]. (2) A person given to killing living beings has abstention from killing by which to attain to the full quenching [of it]. (44) A person given to misapprehending according to his individual views, to holding on to them tenaciously and not discarding them easily, has non-misapprehension of individual views, non-holding on tenaciously and ease in discarding by which to attain the quenching [of them]. What ever is done for oneself is done for others, what ever one does for others, is done for oneself. This teaching do not prefere anyone. It's Mahametta with all, starting be one self. Is it panna, or knowing and seeing, release? Oh, you have been tired. Devas... it's difficult if having terrible much merits ripping, but they exhaust, each day has already gone. May person can only encourage and encourage again, especially those who are living from the alms of the land, avoid all impure ways of livelihood, having faith in the ways of all Paccekabuddhas, Arahats, Buddhas, the Buddhas Follower, to abstain from make use of vehicles. It's not only good and healthy training but give countless on the ways really proper contact with the fourth heavenly messenger, possibility to make high beneficial sacrifies, and even, by being really touched by Saddha, fundation to listen to the Dhamma till liberating one. It's useless, of no benefit for many, and cuts off the Sangha from those having possibilities and society at large, if monks make use of vehicle, fly around like tourists or business men. And also this is as well again a matter of maha-metta in opposite to hypocrisy and preference based on bias: aside of what is called the middle path leading to peace. Peace is possible, step by step. Never had, nor does, or will any Arahat make use of vehicle, accept yāna, aside of ones givers personal strength, getting a sharing of a journey of peace likewise. Even Kings, to come down into borderland, puññavatthu, where forced to make the last way to approach the Buddha independent, meaning without using others, without increasing debts and guilty be using others suffering for ones pleasure. Even in Chistianity similar samples are found, thinking on the day today, in the "three holly kings" visited after long burdensome travel to dedicate gifts to the new born Jesus. The whole story of walking is again a matter that there can no independency found in dependency, there is no merit when based on taking what is not given (e.g. un-sacrificed suffering of others) and that the wheel of giving and taking is ever hard to realize if spending off past merits or living on produsing future debts. Maybe my person finds time and effort to reflect a little on the "young managers walk", the different betweens sport and reality, Upasaka Vithou 's walks and tries in used, seldom someone does. Btw., if thinking on the american tribes: in cases someone, especially a stranger, would sit on a horse, while entering their territory, it would have been regarded as very respectless or even attack. That is also an aspect, people desiring making real merits should consider, thinking that even usual to drive till into the Kuti, like a drive-in customer, or other peoples land in SE Asia. And this not conquering, not lifting oneself, respectful in regard of others attitude is why people with metta woul just walk, as the Buddha, Arahats and all serious followers did, yet some of them really no more needing to make merits as well. If seeing driving, flying gurus, even own intended... then remember this, that it is not so that the attitudes of one in training are given up once one has arrived at the peak. They are just training and teaching householer-equanimity, "meditation" to compensate wrong livelihood, if even that much. Look at this young man! Modern ways, thing on certain caravans and "Dhammayietras" (e.g. March of truth, especially the first)..., are as perverse as their use of such as "buddhist" flags, there is no attitude of the Arahts and the Buddhas disciples traceable for anyone drawing a total wrong and not at all saddha inspiring picture on the culure of the Noble Ones. One importand reason for the practice of going for alms is to be most free of involvements, free of remorse, and harmless. Look for example the way monks are dwelling at a certain place and receive food on stage. How can one not feel involved in the chain of coming to food, transport it, in usual ways. That is, aside of the danger that donors kill, tell to, agree to kill for monks, special dramatic in Vassa-times and Sila-days. The days so many beings will be harmed and die on the roads to make merits. Once following certain Thudongas proper, one is sure to be harmless, not involved in those matters, going for alms respectful, mindful and careful each step, living of what is dedicated as left over and not additional destroyed for thought good sake. Once people get more and more lazy, dependency increases and they become very bond. You may propably see yourself when investigating of what pulls you back. This counts for monks as well. The more they get attached to sensuality and pleasant dwelling, the more they become householders and act in same ways. There was a ironical situation on the walk to Takeo last month. The more one walks down into the more urban areas, the more industrial and bond is life. Having sold land for pleasure, having been lazy... people at large become fabric workers. All over the land little trucks would enter all villages an collect good a half of people, transporting them like animals, 40 standing on 6 squaremeter to the many factories. Not different to the west, just more simple. 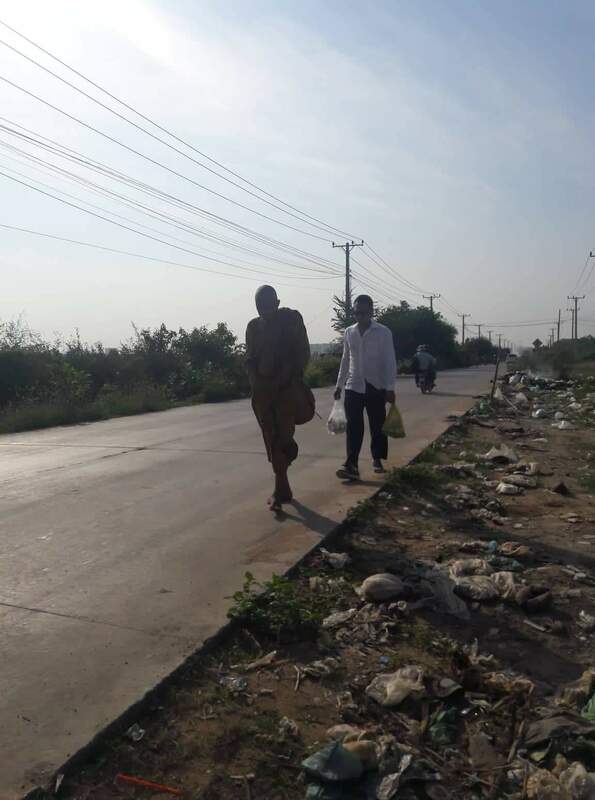 While walking alms, back to the north, in the valleys short before Kampong Speu town, a larger track came up the new sharp-stoned road, having a load of orange clothed people, maybe 60 on it. My person wondered of what this should be and soon saw the reason. 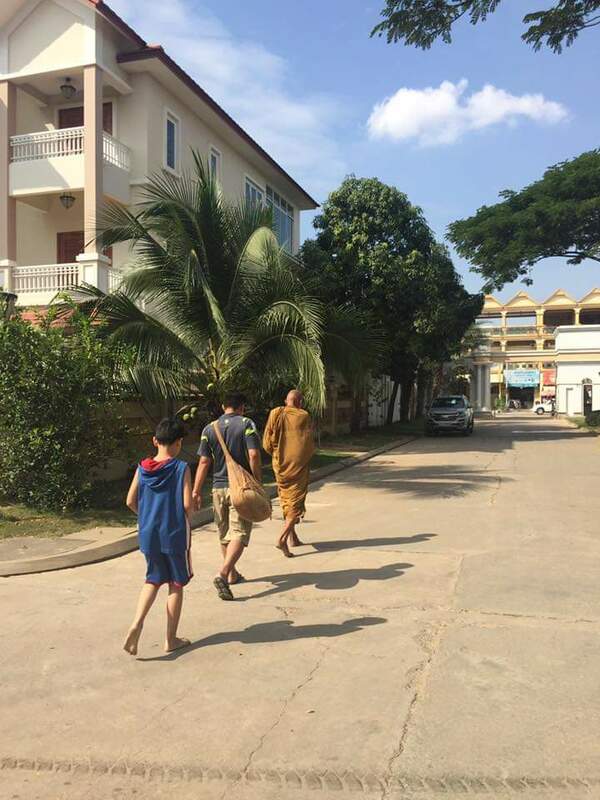 Since going for alms is not realky a pleasure the monks have organised to be transported and on certain places would stop, letting 2 or 4 monks step down and walk for alms, later to be picked up again. Such sample, if even, whom could they inspire for renouncing aside of those celebrating the Upasatha of the Ningantas/Jains in towns. Not even those celebrating that of the cowboys would feel inspired, simply seeing slaves transported in their hired truck. ..yet those fools are not seldom up for what ever rights, climate and other social activism, if not simply pride Jains in fact. I guess it's clear to see that there is no different between the garment worker and there monks and as sadly seen it's not different in Europe hearing yesterday the gratitude talk , by Bhante Mettiko, from Wat Muttodaya, or remembering the stories all over, monks taking the undergrounds and so on... to go pre-informed on alms, simply following rituals without any understanding. Same, same... the Thais would say... the burdens of delight in imperialism and becoming on dry fields with no escape. It's good to think about what ones good deeds will possible take, ones "compassion", one possible defilements and it will stay that way that there is no giving of more benefit having the luck, upanissaya, that a person having left home would cross ones way. No chance to order, plan or getting able if missing of past and present strong condition causes. One may remember the Devas, incl. their king, having tricked around to make merits and after having been rebuked, be told that their act nevertheless bares great fruits, but remember, neither did they use cars nor ungiven sacrifices for others, caused no one pain and suffering to approach those sakes. Walk the talk, Samanera! Walk. The many communities are simply tries to get influence, placed in areas where normal monks are actually incapable to live but supported from outside. In that they are nothing else as commercial or political outpost to occupy areas for wordily interests and it's not different to monasteries in the west, unnaturally, with actually no real base to exist in not corrupt ways. Defilments may always find ways through even best roles for protection, but as the so beloved Dhamma master Ajahn Mun said: "A corrupt mind will always act corrupt with Dhamma..." and those devoted to Sacca are even lesser in this world then the less who have firm Saddha in the Buddhas laid out way. Für Fortschritt ist es nötig fort zu schreiten mit dem was für Freiheit gegeben und passend ist, sich nicht auf unfreiwilligen Kosten anderer und dritter Leiden ein leichtes tun versuchen, hängenbleibend. When people thought of "he came", may person tried to correct their views that if seeing such, it is good to remember that goodness comes, goodness has brought it, goodness of many still existing and walking in this world. Now, what do you like that it would survive for many in this world? "Heros" or goodness, those coming or those going fort inviting to follow step by step?